If you think back to why you moved all the way out to the Coto/Trabuco Canyon area, you’d have to admit that you enjoy the secluded, rustic, California terrain. The stories the hills, horse trails and ancient oak trees of our Trabuco Canyon could tell…tales of cowboys and indians, hunting excurtions, and the people of our local canyons are told and retold everyday, and they never seem to get old. I recently met Dori Nordeck-Odenath, a Coto de Caza resident, and 25-year owner of Trabuco Oaks Steakhouse, and her husband, Al. Over an amazing steak, crab, halibut and ribs dinner, they told Cindy, Andrew, Ken and I the legend of Trabuco Oaks Steakhouse. On June 28, 1968, Eleanor, Duke and Randy Sherod, opened Trabuco Oaks as a snack bar serving campers from O’Neill Park, as well as Trabuco Canyon residents. Eventually they began serving dinner with two rules: 1) “Keep it simple”, and 2) “Do it right”. Ever since, the steakhouse “serves only USDA CHOICE corn-fed beef, the best available, aged just right, and hand-trimmed to their exacting standards. Extra-thick top sirloins, T-bones, and hand-cut filets are broiled over real mesquite charcoal. No gas, no electricity, no folderol. Just the best darn steaks you have ever tasted.” And they truly are! 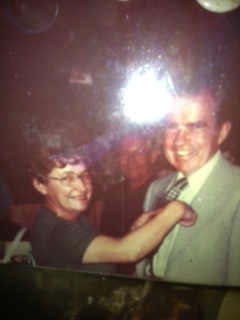 “Doing it right” has attracted many repeat customers, like the local fire fighters, local football teams, other sporty and local legends, as well as President Nixon (there is actually a picture on the highly decorative wall of Eleanor cutting Nixon’s tie!). Please note: There is a tradition here; if you choose to wear a tie, it will be cut off and placed amongst the millions of ties adorning the walls throughout the restaurant. You’ve been warned! 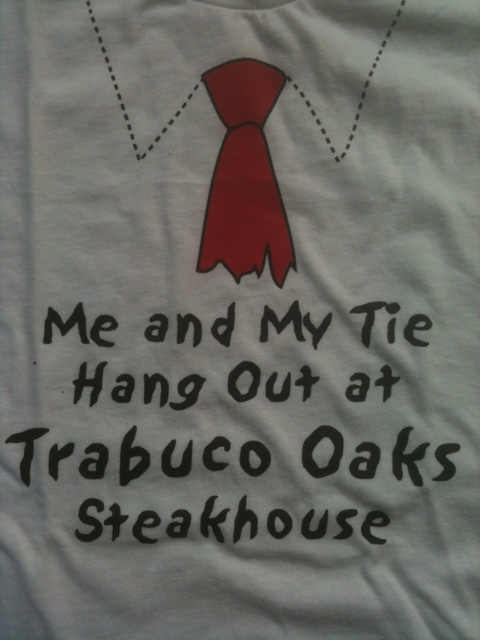 If you’ve never been to Trabuco Oaks Steakhouse, it seems so close, yet so far away. Leaving the big skies of Coto, you venture down into the canyon and will find yourself under an umbrella of oak and sycamore trees. From Coto de Caza Drive, take Plano Trabuco Road out the north un-manned gate, pass SMHS. As you descend into the canyon, Plano Trabuco will turn into Trabuco Canyon Road (Hang on! It’s a curvy road! And watch out for bikers, hikers and horseback riders! ), cross the creek, and, at the ol’ General Store, take a right onto Trabuco Oaks Road and Trabuco Oaks Steakhouse will be on your right. Welcome to rustic Trabuco Canyon! After parking your car/horse with their complimentary valet, you will enter a unique world, overwhelmed with old photos and collectables that tell stories of days of old. We were escorted to a corner table, literally beside a tree! The original owner of this house, actually built the structure to include the tree in the room! Dori took us on a tour of this dark, eclectic steakhouse. She shared with us a “special room”. The staff refers to it as “table 24”. In this private room, is a table that seats about ten. Real barn doors adorned the walls and old pictures hang telling tales of people from years past. As we continued to circle around the steakhouse, we ended up in the front room, decorated with more fabulous ties, an amazing tie quilt, and cool red vinyl booths. Dori can not say enough about how much she “LOVES HER STAFF”! Her loyal cooks, servers and bar tenders have been with the steakhouse a good 20 years! Our server, Kendall, one of the newer hires, has been waiting on steakhouse customers for only 10 years! All the staff we talked to truly enjoy taking care of their guests and love what they do. This attitude is both refreshing and important, and, says a lot about the owner. Bravo Dori! Upon arriving at the restaurant and smelling the BBQ smoke, I realized I was ready, and in the mood for, hearty eating. We had an amazing spread that night, one that any cowboy would have been thoroughly satisfied with. To start off, Ken and Andrew enjoyed a couple of tasty bloody marys. Cindy had her signature Pinot, and I, my dry cab. Dori suggested ordering “Fresh Off the Prairie” – a healthy vegetable ensemble of plump mushrooms, onions and pieces of bell peppers, served in a piping hot skillet, simmering slowly in red eye (sherry), blanketed in cheese and topped with a touch of “prairie dust”. It was easy to entice me to order the special filet (so tender and juicy!) 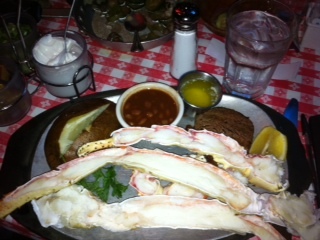 with crab legs (sweet!). 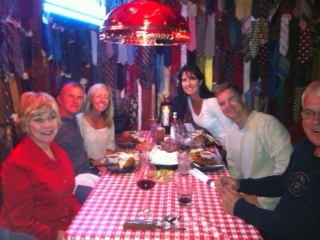 Ken downed the Cowpoke – 16 oz Top Sirloin (the “bigger bang for your buck”). Cindy enjoyed a Kansas City Rib Steak – a juicy 18 oz. bone-in cut mesquite grilled rib eye steak. Andrew’s Catch of the Day was a really good 10 oz. filet of Halibut, which was cooked nicely over mesquite and served with tartar sauce (this was another of my favorites!). We shared a wonderful plate of BBQ Beef Ribs, glazed with homemade BBQ sauce. All entrees are served with their signature house salad (with blue cheese on the side – a nice touch that I really enjoyed! ),their homemade baked beans and great baked potatos. Needless to say, none of us had much room for dessert but decided to split a wonderful Hot Cherry Gizmo – cherry pie filling wrapped in a flour tortilla, deep fried, and topped with hot cherry sauce and whipped cream – oh yeah… it was good! The menu at Trabuco Oaks Steakhouse goes beyond steak. They make a mean patty melt (that I hear is quite addictive), downhome spaghetti, mesquite grilled chicken, fish plates as well as something for the vegetarians. Next time you go, don’t forget your little buckaroos, as they have a great dinner menu for kids also. The beauty of this meal is that it was hearty, healthy, satisfying, and, bizarrely enough, I felt great Sunday morning! We brought a little extra steak home and had the left overs with our eggs, a pot of coffee, and a bon fire outside amidst the cool morning air. Ken and I thought of what legends we will leave behind – some can be retold, and some will go with us to the grave. Thank you, Dori and Al, for your humor, company and hospitality. Thank you, also, for sharing with us the great tales of Eleanor’s vision and continuing to “do it right.” And finally, thank you for keeping the fun and unique traditions of Trabuco Oaks Steakhouse alive.